According to the owners of Rock and Sole Plaice, this Endell Street eatery is the 3rd Fish & Chip shop to open in London since Fish & Chips was introduced in 1861 and serves the “Best Fish and Chips” in the area. I didnt know that there are so many different types of Fish & Chips: Cod, Rock, Haddock, Plaice, Skate. Not quite sure what they means, we based our orders on Lonely Planet recommendations to try their Skate Fish and Chips. The cost for a sit-down meal of Fish & Chips is at least £11. However if you order a takeaway Fish & Chips, it cost as little as £8. There is a clause in the menu that stated that they have right to charge a “store fee” on persons who occupied a seat but did not order any food, during peak hours – rather unfriendly rules but understandable since the outlet is quite small and popular. 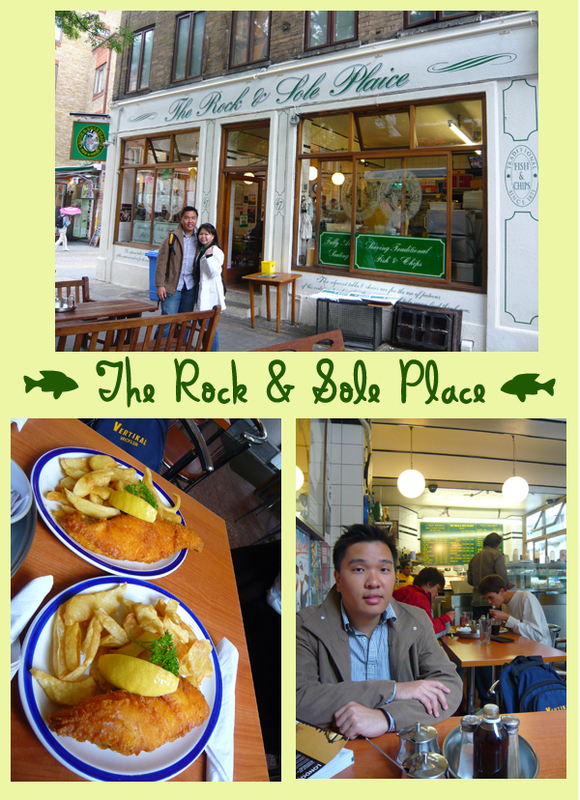 wow the fish n chips look good.. though seems oily.. I’ve not been to the UK before and ppl told me fish n chips is the more affordable meal ..
.-= eunice´s last blog ..makan ur heart out =-. @eunice, Their fish and chips ain’t very oily and it is quite affordable especially if you takeaway – u can save about 2-3 pounds. The Rock and Sole Palaice is known for being a tourist trap and doesn’t have good F&C to boot. Plus who in the world would eat at a 5 pound buffet -for the price you paid there are so many better places to eat in London. @John, thanks for sharing. Unfortunately for me, being a tourist in London for only 3 days, I could not afford the luxury of sourcing around for value-for-money meals and thus have to rely heavily on guidebooks. I think you need to change the title of this article to ‘Not The Best Fish and Chips In London. And John is correct 8 quid for what you got was a rip off mate…but I know it ain’t easy being a tourist trying finding good places to eat.